Date: Year 19 Day 96 Onboard the Lictor-class Dungeon Ship Dyvidium in system Kenosha (123, -100). KENOSHA, Tynna – Earlier this year, galactic news agencies and other interested parties gathered to witness the announcement of a new entrant into the competitive security services industry. Chimaera Consulting (CC), founded by Nikai Tonnak, pledged to bring a fresh take to an industry long stifled by stagnation and a lack of innovation and investment. While many security companies excel in delivering a singular service, Chimaera expressed the desire to challenge the status quo by offering a wide range of specialized services ranging from traditional security tasks and patrols to counter-terrorism operations. The increasing prevalence of corporate espionage and high-profile kidnappings has made it necessary that security contractors be able to identify and address security risks while implementing policies and protocols that will continue to safeguard a business’ or government’s assets and data. Distinguished founding members included the founder himself, Deputy Director Tyr Kratos, and Chief Ilis. Assisting leadership in laying down the framework for the company were Marqon Zenithar and Hadrian Hawkes. Owner and Director, Nikai Tonnak, noted during the ceremony that Chimaera stands out amongst its competitors due to its holistic approach to risk management through in-depth analysis services and proactive consulting, and due to the strong emphasis on the corporate values of integrity, innovation, and excellence. Following the announcement, a more private event allowed commentators and news officials to question the leadership of the company. The company later released a statement saying that had successfully hired on a Chief of Directorates, essentially the person responsible for the day-to-day functions, and identified the employee as Evan Crawford. Those familiar with galactic politics know him as a former military officer of the Hapes Consortium, the former Minister of External Affairs, and experienced businessman. The statement later mentioned that the company had already begun to reach out to various prominent governments and corporations regarding possible business dealings, with promising results. 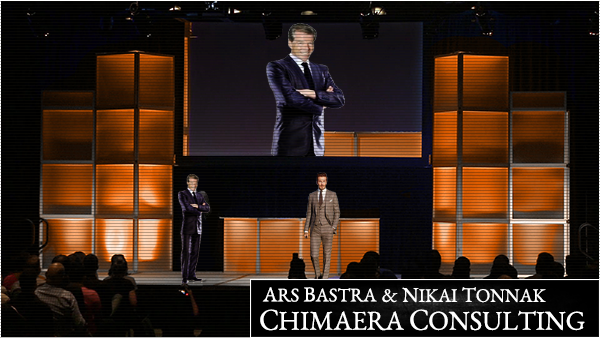 It is too early to tell whether Chimaera will succeed in revitalizing the security industry; but, with the diversified talent within their ranks and experienced personnel they will surely give competitors a run for their money.